"The Search" is a little dramatic series that's a bit of a mystery to me. I found several episodes of it on some Armed Forces Radio and Television Service transcriptions I recently obtained. Although the discs date from circa 1960, I haven't a clue on when the show was produced or where it originated. Each fifteen minute drama looks at individuals in a "real life" situation about jobs, family or relationships that's magically solved by regular church attendance. The shows are hosted by Robert Young and include guest stars like Laureen Tuttle and Joseph Cotten. In program 18, a judge has to deal with a group of teenagers that have been caught smoking "narcotic cigarettes", which is a nice way of saying that the kids are getting high on reefer. Hmm...I wonder if regular church attendance might help the situation? "The Search" was a religious series with something of a non-denominational "soft sell" and the episodes are usually more compelling and well-written than this particular unintentionally funny example. Was the program was originally produced by one of the mainstream Protestant churches for general radio syndication? 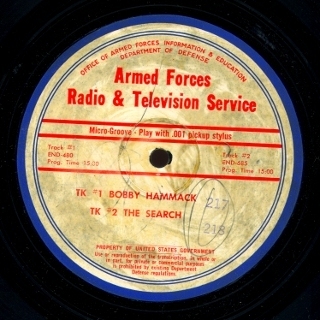 Unfortunately, I haven't had the chance to pick up a copy of Harry Mackenzie's "Directory of Armed Forces Radio Service Series" discography, since I'm spending my collecting funds on discs. Anyone have it handy and know if "The Search" included in his book? The show was transferred from an original AFRTS vinyl microgroove transcription. The episode number on the label - 218 - is a misprint. It's number 18 in the matrix, matching the number sequence of other programs I have in the series from this period.